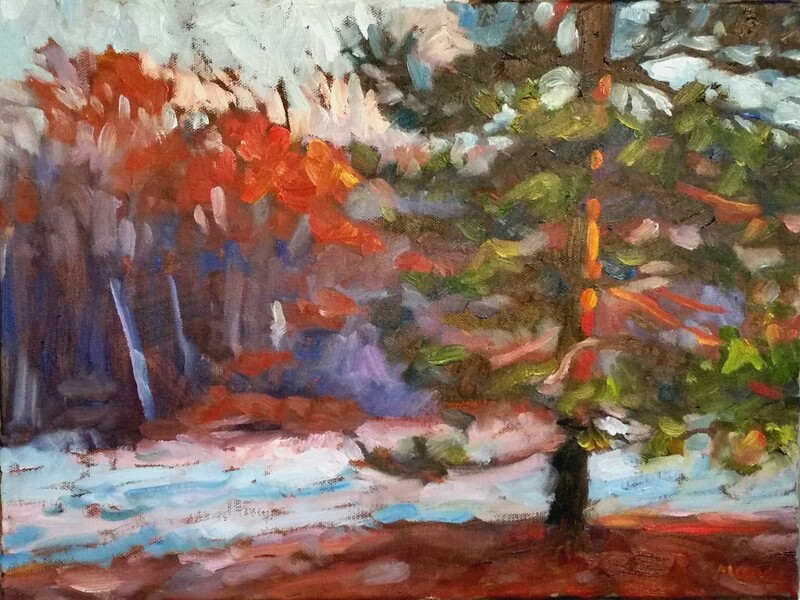 Like many artists in winter, I don’t have much time to get outdoors to paint. By the time I get home from work, it’s usually dark. However, I paint every week, often several evenings. These are some recent paintings from photos that I took this autumn. One is from a trip to the Indiana Dunes in 2015. As a contemporary impressionist, I try to capture the “feel” of the scene rather than every little detail. It is often difficult to restrain myself. I think in this day and age, with the benefit of photos, many artists often fall prey to the tendency of painting every detail which has been captured by the camera. But that is not actually the way we see. We see what is directly in front of us but the peripheral edges are often lost. The advent of modern photography continues to tempt us. But that is not why we are artists. Anyone can take a photo but only the few can interpret their feelings in an artistic medium. 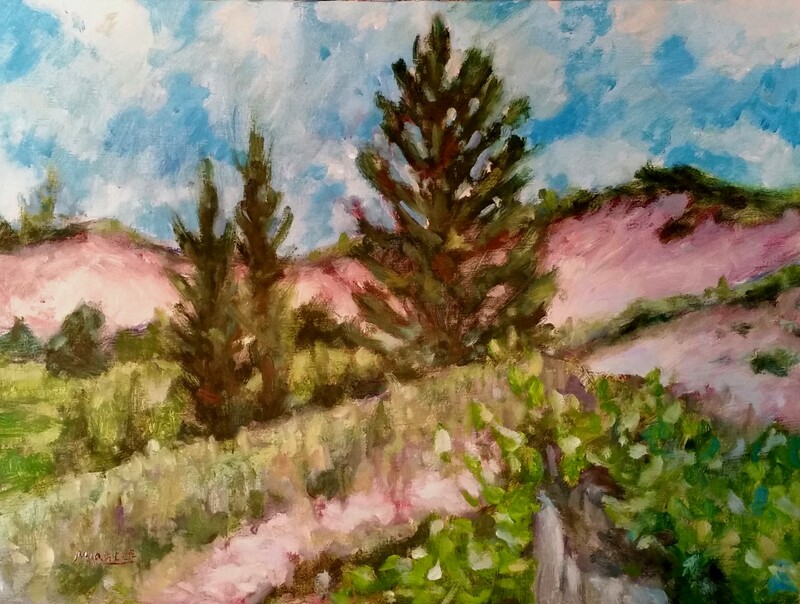 This first painting is from a trip that we made to the Indiana Dunes in 2015. Surprising enough, this national park is set on the shore of Lake Michigan in northern Indiana. It seems to have been carved from an industrial landscape but if you spend some quiet time here, you can imagine what the shore was like 100 years ago. I wish I had painted this with a little warmer tones but that is in hindsight. Love the sketchiness of the trees and the ever-moving sand. 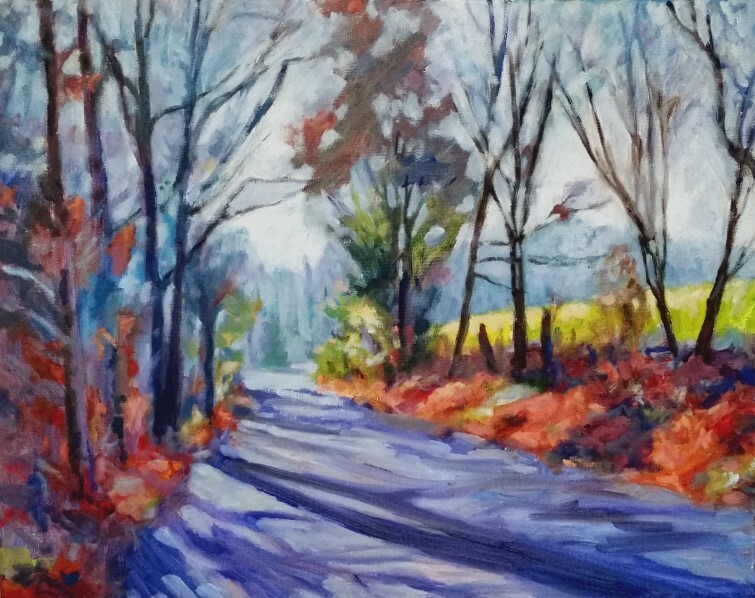 This next painting is from a photo I took on a walk along my country road this autumn. It is difficult to not go overboard with the bright colors which could lean to garishness. I had to make a great effort to push back the far trees to add some atmosphere which enhanced the foreground trees and the lovely green of the cattle pasture to the right. The final painting is just a glance out my bathroom window one frosty morning. Love the early morning light catching the pine tree with the colorful woods behind. Not so successful capturing the feeling of frost. It looks more like a river or lake but there you have it. As any experienced artist knows, not every painting turns out as we wish. But we always learn something, even from our failures. This entry was posted in contemporary impressionism, country living, landscape, oil painting and tagged art, contemporary impressionist, country living, indiana, kit miracle, oil painting. Bookmark the permalink.